Rugby Union, a popular full-contact sport played throughout the world, has one of the highest rates of concussion of all full-contact sports. The aim of the current review was to systematically evaluate the available evidence on concussion in Rugby Union and to conduct a meta-analysis of findings regarding the incidence of concussion. Articles were retrieved via a number of online databases. The current review examined all articles published in English up to May 2014 pertaining to concussion in Rugby Union players. The key search terms included ‘Rugby Union’, ‘rugby’, ‘union’, and ‘football’, in combination with the injury terms ‘athletic injuries’, ‘concussion’, ‘sports concussion’, ‘sports-related concussion’, ‘brain concussion’, ‘brain injury’, ‘brain injuries’, ‘mild traumatic brain injury’, ‘mTBI’, ‘traumatic brain injury’, ‘TBI’, ‘craniocerebral trauma’, ‘head injury’, and ‘brain damage’. The final search outcome following the eligibility screening process resulted in the inclusion of 96 articles for this review. The meta-analysis included a total of 37 studies. The results of the meta-analysis revealed an overall incidence of match-play concussion in men’s rugby-15s of 4.73 per 1,000 player match hours. The incidence of concussion during training was 0.07 per 1,000 practice hours. The incidence of concussion in women’s rugby-15s was 0.55 per 1,000 player match hours. In men’s rugby-7s match-play, concussion incidence was 3.01 per 1,000 player match hours. The incidence of concussion varied considerably between levels of play, with elite level play recording a rate of 0.40 concussions per 1,000 player match hours, schoolboy level 0.62 concussions per 1,000 player match hours, and the community or sub-elite level recording a rate of 2.08 concussions per 1,000 player match hours. 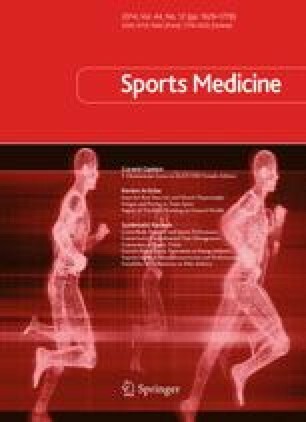 The incidence of concussion in men’s rugby-15s as a function of playing position (forwards vs. backs) was 4.02 and 4.85 concussions per 1,000 player match hours, respectively. Concussion is a common injury sustained and reported in match play and to a lesser extent during practice by Rugby Union players. Based on the available published data, there appears to be a variation in risk of concussion across level of play, with the sub-elite level having the greatest incidence of injury. Future research focused on studying the acute consequences and best management strategies in current players, and the potential longer term outcomes of concussion in retired players, is needed. A focus on the areas of prevention, injury identification, and medical management, and risk for long-term outcomes will be of benefit to current athletes. The online version of this article (doi: 10.1007/s40279-014-0233-3) contains supplementary material, which is available to authorized users. The authors thank Debbie Booth from the University of Newcastle for her assistance with the initial database search and Sarah Hiles from the University of Newcastle for her assistance with methodology regarding meta-analysis. Funding was provided by the Brain Foundation, Australia; NSW Sporting Injuries Committee; and Hunter Medical Research Institute (HMRI) funded by Jennie Thomas. Andrew Gardner has a clinical practice in neuropsychology involving individuals who have sustained sports-related concussion (including current and former athletes). He has received travel funding from the Australian Football League (AFL) to present at the Concussion in Football Conference in 2013. Previous grant funding includes the New South Wales (NSW) Sporting Injuries Committee, the Brain Foundation, and the Hunter Medical Research Institute, supported by Jennie Thomas. Grant Iverson, Ph.D., has been reimbursed by the Government, professional scientific bodies, and commercial organizations for discussing or presenting research relating to mild traumatic brain injury (TBI) and sport-related concussion at meetings, scientific conferences, and symposiums. He has a clinical and consulting practice in forensic neuropsychology involving individuals who have sustained mild TBIs. He has received research funding from several test publishing companies, including ImPACT Applications, Inc., CNS Vital Signs, and Psychological Assessment Resources (PAR, Inc.). He is a co-investigator, collaborator, or consultant on grants relating to mild TBI funded by several organisations, including, but not limited to, the Canadian Institute of Health Research, Alcohol Beverage Medical Research Council, Rehabilitation Research and Development (RR&D) Service of the US Department of Veterans Affairs, Vancouver Coastal Health Research Institute, and Roche Diagnostics Canada. International Rugby Board (IRB). IRB strategic plan. http://www.irb.com/aboutirb/organisation/strategic/index.html. Accessed April 29, 2014.
International Rugby Board (IRB). IRB playing charter. http://www.irb.com/mm/Document/AboutIRB/0/PLAYINGCHARTER_6259.pdf. Accessed 29 April 2014. IRB. International Rugby Board Concussion Guidance for General Public Document. Available from: http://irbplayerwelfare.com/pdfs/Concussion_Guidance_for_the_General_Public_EN.pdf. Accessed on April 25, 2014. Rugby Football Union. Rugby Football Union (RFU) Concussion Resource Document. http://www.rfu.com/takingpart/playerhealth/concussion/~/media/files/2013/taking%20part/concussion/2%20concussion%20in%20rugby.ashx. Accessed 20 May 2014. England Professional Rugby Injury Surveillance Project: 2010–2011 Season Report. http://www.irbplayerwelfare.com/pdfs/RFU_Community_Rugby_Injury_Surveillance_Report_10_11_EN.pdf. Accessed May 20, 2014. England Professional Rugby Injury Surveillance Project: 2011–2012 Season Report. http://www.rfu.com/~/media/files/2013/thegame/rfu_injury%20audit%202013_web.ashx?utm_source=mdm&utm_medium=email&utm_campaign=England+Professional+Rugby+Injury+Surveillance+Project. Accessed May 20, 2014. England Professional Rugby Injury Surveillance Project: 2012–2013 Season Report. http://www.rfu.com/takingpart/~/media/files/2014/takingpart/injury_audit_report_2014_.ashx. Accessed May 20, 2014. RFU Community Rugby Injury Surveillance Project CRISP: 2011–2012 Season Report Summary Information. http://www.rfu.com/~/media/files/2013/taking%20part/playerhealth/130402_crisp_season_report_1112_rev_2.pdf. Accessed May 20, 2014. Fuller CW, Taylor A, Raftery M. Epidemiology of concussion in men’s elite Rugby-7s (Sevens World Series) and Rugby-15s (Rugby World Cup, Junior World Championship and Rugby Trophy, Pacific Nations Cup and English Premiership). Br J Sports Med. doi: 10.1136/bjsports-2013-093381.